Charles Eley's Website | Go Green! My book Design Professionals Guide to Zero Net Energy Buidlings is available for purchase. Click here for more details. Click here to order. I will be giving speaking on the ZERO Code for California at the annual seminar sponsored by the Golden Gate Chapter of ASHRAE, the Center for the Built Environment, and Pacific Gas and Electric Company. The title of the day-long event is "The Changing Face of ZNE and Responsible Grid Citizenship". The event will be live at the Pacific Energy Center and streamed live. Click here to register. I will be giving an evening lecture at the Pacific Energy Center on September 18 on Architecture 2030's ZERO Code (California version). You can register by going to https://lnkd.in/gqxzm95. Also visit www.zero-code.org for more information about the ZERO Code. The July 2017 issue of the ASHRAE Journal includes an article on the feasibility of zero net energy for a range of building types and climates. 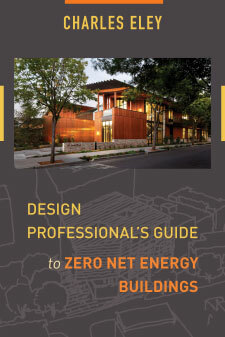 Material was adapted from my book, Design Professional's Guide to Zero Net Energy Buildings. Click here here to read. The June 2017 issue of the ASHRAE Journal includes a forum with myself and other leaders of the Zero Net Energy (ZNE) movement. The following are some of my contributions. See the article for perspectives from Paul Torcellini, Smita Gupta, Jon McHugh, Mike Rosenberg and others. The City of Palo Alto Development Services Department is hosting a Zero Net Energy for Design Professionals training on May 23rd 2017. The training will feature Mr. Charles Eley, FAIA, PE, an internationally recognized leader in the area of Zero Net Energy and a veteran in the field of energy efficiency. The training will support the implementation of the current Energy Reach Code. The training format is based on Mr.
Charles will speak about is book on zero energy buildings at the Golden Gate ASHRAE meeting on June 8, 2017. Click here for more information. Charles will talk about his book at the American Institute of Architects San Francisco Chapter on February 21, 2017. Books will be available for purchase from Builder's Booksource. Pacific Gas and Electric Company will host a book launch event on January 26, 2017. Click here for details. Click here to register. I will discuss my new book at a round table meeting in Seattle on November 16, 2016. Click here for more details. Later in the evening there will also be a book presentation at Seattle Town Hall.